Now we who have travelled to West Africa know why Antonie Saint-Exupery loved the desert and why his little prince loved the sunset more than the sunrise. As seen from the airplane, the north African desert stretches endlessly, a red-tinged yellow-brown, with mysterious ridges that appear sporadically in geometric formation. One wonders what mystical peoples passed through those places or inhabit them now. Oases lie flat blue-green splotches scattered here and there, sometiems in a cluster. The dunes rise gracefully as if the warm sun were soothing instead of scorching. Exupery must have known well these mysterious sands that enveloped him as he delivered mail in north Africa, as he crashed in 1935 at 2:45 in the morning, and as he watched his Bedouin saviors crystalize out of the misty mirage. 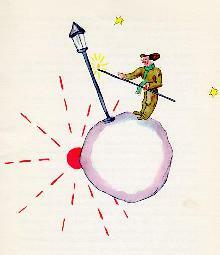 No wonder Exupery loved the desert and extracted its deep wisdom for the world to ponder on. 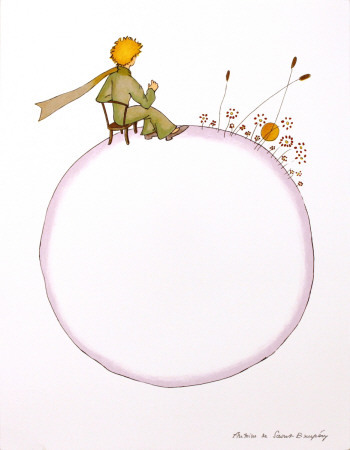 Only he who had suffered the intense dryness of the desert could express the little prince’s longing for water, liquid and luscious bubbly mirth. Only Exupery would have his little prince love the sunset more than the sunrise. For more than the wonders of the sands is the beauty of the African Sahara sunset. From the air, the flat desert expanse suddenly ends at the horizon in a mystic arrangement of green, yellow, and red lines that melt into a starry blackness. In America and Asia sunsets are golden and warming but the African desert sunset is mysterious and enlightening as ancient wisdom emanates from the sandy horizon. The sunset lasts for as long as we fly southwest, then slowly ebbs away as we turn straight south. But on your tiny planet, my little prince, all you need to do is move your chair a few steps. Tags: Africa, desert, Exupery, sunset, The Little Prince. Bookmark the permalink.